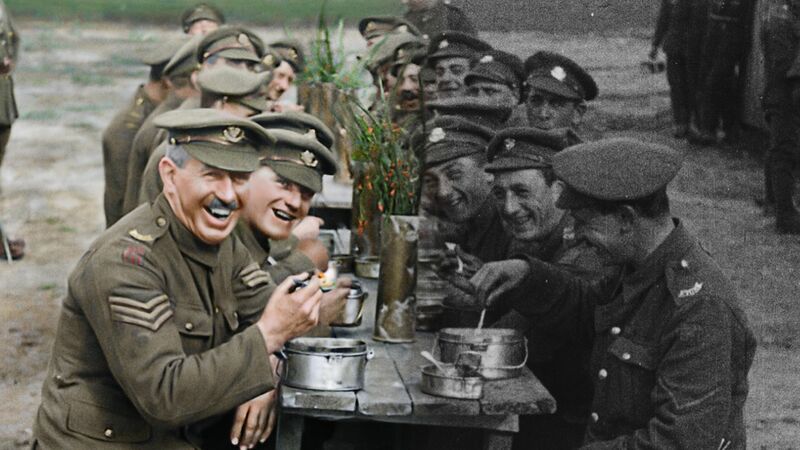 About a half an hour into They Shall Not Grow Old, the new documentary by Lord of the Rings director Peter Jackson, British soldiers leave their black-and-white training camps and arrive in color on the widescreen Belgian battlefields of the First World War. The transition is momentous even as the entire audience is expecting it; here is the moment where we are finally, more than a century after the Armistice of 1918, to understand the reality of the war as soldiers ‘actually experienced it.’ By restoring and colorizing newsreel footage (as well as correcting speed discrepancies and adding sound and speech with the aid of lip readers), Jackson attempted to “reach through the fog of time and pull these men into the modern world, so they can regain their humanity once more—rather than be seen only as Charlie Chaplin-type figures in the vintage archive film.” But colorization is never that simple, and though Jackson seeks to “bring the past alive,” adding color does much more than just that, if it even does it at all. Jackson, a New Zealander who dedicated the film to his British grandfather—a veteran of the war—was commissioned by the Imperial War Museum in 2015 to make a documentary commemorating the centennial of the war’s end. From hundreds of hours of the Museum’s clips and oral testimonies of British soldiers, Jackson cut a one hour and 40 minute documentary that follows soldiers through the terrors and tedium of the war. Though in the film’s post-credits, behind-the-scenes documentary, Jackson claims They Shall Not Grow Old is not a “historical film,” it is nonetheless based on a strong historical and ideological argument: in order for audiences to connect with footage of the First World War and understand the conflict as a real event, the footage must be colorized. After all, as the film’s trailer says, “The people who experienced it did not live in a silent, black-and-white world.” But does colorization actually make the past any less distant, or make historical images any more real? Colorization operates on three primary levels: aesthetic, commercial, and ideological. These three concerns are not independent of each other, but rather almost always intertwine: for example, in the 1980s, Ted Turner, believing that teenagers raised on color television couldn’t stand black-and-white movies, added color to his archive of classic MGM films to attract younger audiences, creating new versions that critics panned for their washed-out look and lack of visual subtlety. Colorization is an ideological process because it reflects the colorizer’s belief that the black-and-white cinematic past would be more enjoyable and believably real to contemporary audiences if it were in color. More than the other two, the ideological dimension becomes especially significant when documentary films, which are not only works of art but also works of history, are colorized. This is not to say that They Shall Not Grow Old has no important aesthetic successes or failures. On the contrary, the beauty of many scenes (including a gorgeous recurring shot of shadowed soldiers and horses returning to camp under purple and orange twilight) makes a strong case for the visually expressive merits of colorization. The grass in Belgian fields is not just green, but many greens that cascade as each individual blade flows in the wind. But while Jackson’s precise treatment draws the audience’s eyes and hearts to the natural beauty of the landscape, it has the opposite effect when depicting the men who fought the war. The soldiers are real the way wax figures are real; the execution is always slightly off, but it would feel cruel and obvious to point it out. One cheek here is too pudgy, a mouth droops and bulges there. Motion is a crapshoot—a milky smooth face can suddenly smudge with a turn of the neck or an open-mouth grin of blackened teeth. Though the filmmakers sometimes do not seem to know how living humans look, they certainly know how to depict bloodied corpses, and therefore make the poor decision to depict them a dozen or so times. Anxieties over colorization’s visual effects are nothing new: well before critics and theorists in the 1980s traded barbs over Turner’s televised version of It’s a Wonderful Life, silent-era Hollywood purists supposedly said adding color to black-and-white films was like “putting lip rouge on Venus de Milo.” But the stakes are different in this case. No one needs to be concerned that They Shall Not Grow Old defaces the legacy of a beautiful film past in a shallow search for 16-year-olds’ eyes and cash. They Shall Not Grow Old does not ask what colorization does to film, but what it does to history. It would be easier to buy the film’s view of history if it were applied consistently throughout. Only footage of the war itself is colorized, making it seem that though Jackson wants to bring the past alive, the only past he considers worth resurrecting is that of young British men killing and being killed. Meanwhile, the bookending depictions of everyday British life remain in the supposedly non-real world of grainy monochrome, as if the stories of women factory workers and schoolchildren deserve to remain distant. Regardless of what Jackson thinks, this footage is emotionally affecting, and the social history it embodies does more to reduce historical distance than any amount of digital color. When Jackson denies that They Shall Not Grow Old is a historical film, what he means is that it is a war film. After the credits, he brags that he did such a good job with the restoration (which is true, though the best evidence is the few moments of restored black-and-white clips) that he was able to zoom and pan to make the century-old footage feel cinematic to 2018 audiences. There’s something strange about mining newsreel footage and photographs of dead bodies for Saving Private Ryan–style drama, but what’s worse is that though this choice may make the film more compelling, it reveals the inherent contradictions of its ideology of colorization. If Jackson sees colorization as a way of reaching audiences—only a month after its wide US release, They Shall Not Grow Old is already one of the highest-grossing documentaries of all time—then aping the visual style of popular war films is a good strategy. But if he is trying to present the reality of the war as soldiers experienced it, then editing that reality codes the footage as modern and fictional, inserting artifice where it is not welcome. The irony of colorization is that it is a process that uses overt artifice to make a film look more real. But all film—and all history—is, on some level, artificial. We can try to understand the past, even hope to learn from it, but we will never be able to experience it first-hand through any representation. What does it matter if historical footage of the First World War is in black and white? For a century, people around the world have understood the war through black-and-white photographs and films, and this has created a visual shorthand for understanding the war in its historical context. Colorization initially jars us because it troubles this unspoken code and shows us that the past was indeed in full, resplendent color. This is an unequivocally good thing; in order to dislodge and replace narratives that prevent us from reckoning with the past as it occurred, new visions of history must unsettle us. Our ideology, in other words, must be shaken, and new narratives must settle it. This is the process of history creation: formulating and reformulating to move ever further toward a truth we’ll never get to. Authentic color images of events typically seen in black-and-white upend our historical imagination not because they show us that the past was in color, but because they reveal that people saw in color and sought out technology that would allow them to represent the world with a broader palette than black-and-white film allowed. Bill Manbo’s Kodachrome photographs from within a Japanese-American internment camp in Wyoming, published in the 2012 book Colors of Confinement, force us to reconsider our distance from the Second World War and the era of fascism through the representation of blue ties and pastel pink dresses, brown rust and green leaves. But these images stand as a counterpoint to black-and-white photographs; without colorization’s ideological attempts to restore colors that were never there to present the past ‘as it really was,’ Manbo’s photographs do not replace black-and-white images. Rather, they serve as evidence that Japanese internment was neither a black-and-white event nor a color event, but an event that affected people whose experiences cannot be reduced to the images that photographers and filmmakers represented using the materials available to them. But the colorization in They Shall Not Grow Old cannot capitalize on the moment of unsettlement because its representation of the past is artificial and looks artificial. After the soldiers arrive in Belgium in shocking color, the jarring feeling of historical unease doesn’t end until after the credits, when Jackson shows the audience how he colorized the film; only by seeing the black-and-white and colorized clips side-by-side can we again feel stable in our understanding of what is real. Colorization forever changes the way audiences view the original images and the history they depict, but this doesn’t mean that the new perception is ‘better’ or ‘more accurate.’ If audiences walk into the film imagining the First World War in black-and-white and leave with an image of it as a high-resolution computer game, then colorization has not brought them closer to the past at all. By presenting the colorized film as more ‘real’ than the black-and-white original footage, Jackson hides the artifice and ideology that support the colorization process. Black-and-white, in his estimation, is an aesthetically and historically compromised format that cannot adequately convey truth. But colorization is an inherently flawed process, and its shortcomings may undermine the historical awareness that Jackson seeks to create. In the end, a black-and-white past is no less real than one cast in wax. BEN BIENSTOCK B’20 has finally decided that it’s okay that he imagines the past in black-and-white.